When the Volvo Ocean Race starts this weekend, it will feature the smallest starting field in the event’s 38-year history — and perhaps the most evenly matched. A fleet of six yachts will compete in the grueling around-the-world race, hoping to navigate more than 39,000 nautical miles on their way to one of the most prestigious titles in sailing. The race starts with an in-port race in Alicante on Saturday before the first offshore leg begins on Nov. 5. The boats are expected to reach the finish line in Galway, Ireland, in July 2012. This is the smallest fleet ever to compete in the event, which began as the Whitbread Round the World Race in 1973, although the numbers have gradually declined since a record 29 boats started the 1981-82 version. Since 2001-02, no race has featured more than eight boats. But all six teams have similar budgets this time, and all 11-man crews have enough experience to and know-how to be the first to reach Ireland. "The level of the teams in this race is exceptionally high," Team Sanya skipper Mike Sanderson of New Zealand said. "Never before has it been so hard to pick a favorite. We have an incredibly level playing field and it’s going to be an amazing race." Five of the boats are brand new, with only Sanya using a yacht from the last edition. Spanish entry Telefonica, France’s Groupama, United States-based Puma, Abu Dhabi Ocean Racing, and Camper with Emirates Team New Zealand are all using new Volvo Open 70 racing yachts. Puma finished second in the last edition in 2008-09, and is looking to do one better with America’s Cup veteran Ken Read from Newport, R.I., as skipper. "This race often puts the sailors in the most miserable spot they could be on earth," Read said. "You are either boiling hot or freezing cold and you are always wet, sleep deprived and hungry. Other than that it’s fantastic." The race will take the boats to 10 different ports, including stops in South Africa, Abu Dhabi, China, New Zealand, Brazil, France and Portugal. Boats will start the second leg from Cape Town and head to an undisclosed port before being transported closer to the finish in Abu Dhabi. In the third leg, the boats will start from Abu Dhabi before being transported to another location ahead of the finish in Sanya, China. British double Olympic silver medalist Ian Walker has returned for his second consecutive attempt to win the race, this time as skipper of Abu Dhabi Ocean Racing, the first-ever Arab entry. Telefonica is led by Iker Martinez and Xabi Fernandez, who won Olympic gold together in the 49er class in Athens in 2004 and silver four years later in Beijing. Camper has chosen Chris Nicholson of Australia as skipper. Groupama is the first French entry since Eric Tabarly skippered La Poste in 1993. The team is led by Franck Cammas, a multihull record breaker. 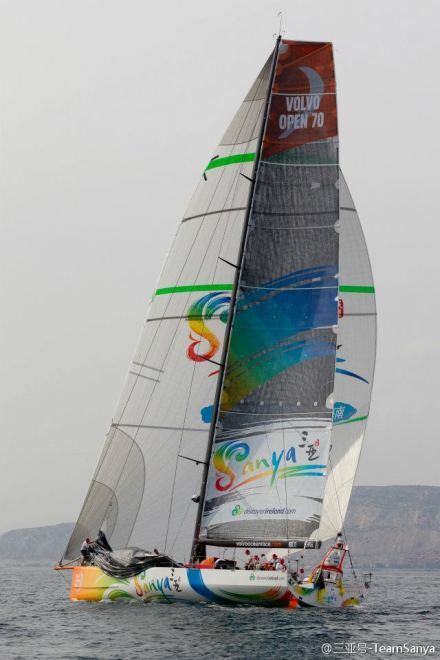 Sanya’s Sanderson is the only skipper to have won the event before, with ABN Amro One in 2005-06.